Oral diseases are a neglected epidemic as almost everyone is affected. Oral health is important for overall health and wellbeing. Although most oral diseases are preventable and have common risk factors with other non-communicable diseases, integration of oral health into public health systems is still limited. The Global Charter for the Public’s Health, developed by the World Federation of Public Health Associations (WFPHA) and the World Health Organization (WHO), is a framework that aims to streamline the functions and services of public health. 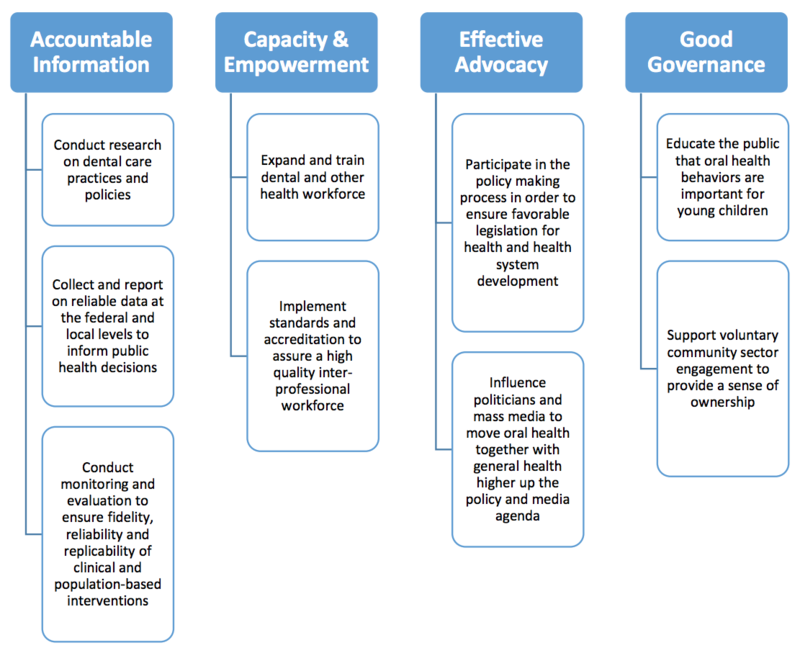 This policy statement describes how oral health can be integrated into public health systems using the components of the Global Charter for the Public’s Health framework. The statement is an international call to action for all public health professionals in all countries of the world to advocate for the full integration of oral health into public health systems. The consequences of poor oral health are not merely a burden on the individual but also on society as a whole. In most industrialized nations, dental caries affects 60-90% of school children and nearly 100% of adults. Oral diseases have a significant impact on health systems through the cost of admission and time spent in hospitals as a result of complications arising from these diseases. The treatment of oral diseases themselves is also extremely costly; an economic burden report (analyzing high, middle and low-income countries) estimated that the global impact of oral diseases totaled US $ 442 billion in 2010. Curative oral healthcare in industrialized countries has been reported as being responsible for 5-10% of public health expenditure, making oral diseases the fourth most expensive disease to treat. Although oral diseases are usually attributed to the lack of oral health knowledge, appropriate attitudes and best practices at an individual level, it is very important to take a public health approach to improved oral health. This approach uses a socio-ecological model to address the social determinants that affect health behaviors, access to and availability of timely oral health treatment, and the implementation of healthy policies and population-based prevention strategies. Despite significant improvements in oral health in many populations globally, the burden of disease is highest in disadvantaged populations in both developed and developing countries. [11,12] Solutions to reducing the burden in vulnerable populations require removal of barriers to accessing oral healthcare services, provision of finances for prevention and treatment, and a commitment to multiple prevention strategies. A tangible example of the association with chronic diseases is dental caries and obesity. Sugar is one of the main factors that lead to dental caries, obesity- and Type II diabetes. In 2013, a systematic review reported that there was a significant relationship between childhood obesity and dental caries. A separate study also demonstrated the association between diabetes and periodontitis and urged healthcare professionals to integrate oral and general health services. 15 years of research, reports, and recommendations addressing the dental–medical divide have resulted in little serious action to tackle this growing divide. [18,19] Since oral and major chronic diseases have many determinants in common, emphasis should be placed on the common risk factor approach, which addresses risk factors that lead to many chronic conditions within the context of the wider socioenvironmental milieu. In addition, aging populations and rapid globalization is a further reason for an integrated response to oral health and other chronic diseases. The World Health Organization (WHO) urges oral health interventions to integrate common risk factors better and focus on improving health as a whole, at the same time reducing social inequalities. 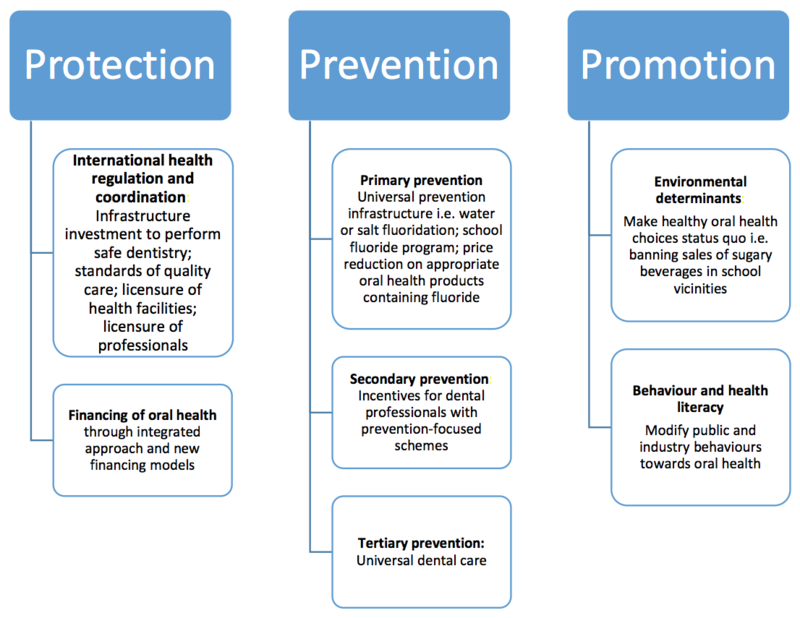 Since oral diseases and NCDs have common modifiable risk factors and social determinants, oral health stands to benefit from these NCD global action plans. In light of these action plans, the World Dental Federation (FDI) urged national dental associations to collaborate with NCD organizations to promote common solutions. In a policy brief, FDI reiterated the importance of integrating oral health into health systems and health curricula, including amalgamating oral health and NCDs into Sustainable Development Goals (SDG) strategies and monitoring frameworks. Although these recommendations are timely and of utmost importance, the implementation process in reality is very complex and needs to be tailored to the culture and context of each country. The integration of oral health into general health is under development in many countries. A report by the Alliance for a Cavity-Free future (ACFF) and the Policy Institute at King’s College London stated that some of the barriers to dental caries prevention include a lack of health care payment systems that support preventive care and absence of reliable surveillance data to inform solutions using comprehensive economic analyses. The dental community should be more active in overcoming these barriers and in driving policy change to achieve relevant goals and targets included in the UN SDGs. As WHO reported in its 2011 “Future Use of Materials for Dental Restoration” report , Mercury is highly toxic and harmful to health. Approximately 80% of inhaled mercury vapor is absorbed in the blood through the lungs, causing damages to lungs, kidneys and the nervous, digestive, respiratory and immune systems. Health effects from excessive mercury exposure include tremors, impaired vision and hearing, paralysis, insomnia, emotional instability, developmental deficits during fetal development, and attention deficit and developmental delays during childhood. The report considered that dental personnel may experience occupational exposure in dental clinics with poor mercury handling practices and that dental fillings made with amalgam can be a source of human exposure to elemental mercury vapors for many populations. A significant amount of mercury is estimated to be released to the environment from the use of dental amalgam either as an indirect result of the diversion of traded amalgam for other purposes or as a result of improper waste management practices or through cremation. When released from dental amalgam use into the environment through these pathways, mercury is transported globally and deposited. Mercury releases may then enter the human food chain especially via fish consumption. As included within the international treaty the “Minamata Convention” with respect to the clinical restoration of teeth for oral health, measures should be taken to phase down the use of dental amalgam taking into account a countries domestic circumstances and relevant international guidance. The World Federation of Public Health Associations’ (WFPHA) Global Charter for the Public’s Health (The Charter) is a broad framework that streamlined the functions and services of public health. In brief, the charter consists of (i) services: protection, prevention and promotion; and their enabling (ii) functions: governance, advocacy, capacity and information (Figure 1)[2,26]. These components encompass the multifaceted nature of public health and conceptualize the integration of oral health into public health systems. The ultimate aim of the Charter is to create resilient, sustainable and secure health systems worldwide that are able to meet any present and future public health challenges. The Charter’s goals and functions could potentially be used to unite all public health professionals to align their action plans under the same framework. Leaders of national, state dental associations and societies have always played important roles in establishing oral health policy. Now there is a growing democratization of awareness, and a world movement. WFPHA’s oral health working group (OHWG) has developed a series of resolutions to improve access to oral health, guarantee appropriate infrastructure and increase capacity and has provided potential solutions to tackle common NCD risk factors. These WFPHA policy resolutions related to capacity, access to care, and regulatory action present a basis for action towards an oral health agenda in each country. They represent a first step and will be followed by other policy papers and advocacy actions related to hot topics in oral and public health in the broad sense such as sugar tax, environmental impacts of mercury etc. as deemed appropriate. Oral diseases are a costly public health issue, which need a population-based approach that maximizes the use of limited existing resources to respond. In 2014, the WFPHA OHWG completed an international survey of its member countries of their dental public health workforce infrastructure. This survey conducted in 73 countries, covering all WHO regions, revealed that in 62% of countries, dental public health is only partially integrated in the public health system, while in 25% of the countries it has not been formally integrated at all. Dental Public Health (DPH) programs at masters level are available in 44% of countries. Over half of countries had up to 10 trained DPH professionals. It is crucial that specialists trained in dental public health lead their countries to implement better oral health prevention and treatment systems. The first step is to improve capacity by training an oral public health workforce for national public health systems, as highlighted in the WFPHA policy on Dental Public Health Workforce Infrastructure. Dental health educational institutions should use their capacities to train and empower the next generation of public health dentists and leaders to not work in isolation in their own discipline but jointly with other public health professionals to integrate oral health fully into core public health components. Another tactic currently being utilized effectively and successfully in more than 50 nations as well as in three states in the U.S. are mid-level dental providers, also known as dental therapists. Research has confirmed dental therapists provide high quality care that is very cost effective. Furthermore, the availability of having dental therapists working in underserved communities remedies the scarcity of dentists. Additionally, non-dental health professionals and primary care providers should be trained in dental public health and obtain the legal approval to perform selected oral health interventions and screening and provide other preventive services. Public health teaching, whether it is in oral health or general health, should be fully integrated into all aspects of the health delivery system. Transforming and scaling up health professionals’ education and training should also include the analyses of the materials and techniques to be used in dental practice and their impact on human health and the environment; for example the techniques and materials related to restorative dentistry are changing quickly and offer the opportunity of both improving long-term functionality and reducing their environmental foot print by reducing mercury release. The next step is to improve the infrastructure of health systems by incorporating oral health into primary health care in public health systems. The burden of oral diseases impacts primary health care systems globally. All primary health care and public health personnel, not just dental personnel, have a role in the prevention and treatment of oral diseases. Oral diseases have common risk factors with NCDs and these diseases are preventable through strategies such as reduction of sugar intake, improved oral hygiene, and reduction of tobacco and alcohol intake, which can be addressed through the integration of oral health within primary health care and public health systems. Public policies such as regulation of unhealthy products at global and national level as well as effective community based interventions should be the foundation for better oral health in all countries. Capacity and infrastructure will lead to improved access to oral health care for all. The WFPHA has developed a policy paper on this topic calling for the integration of oral health into primary health care and public health system, and has been advocating towards this end for several years. Access to oral health care, both in high and low income countries, across the life cycle is critical to overall health, and it will take flexibility and ingenuity among multiple stakeholders—including government leaders, oral health professionals, and others—to make this access available. Access for people appears multi-dimensional and multi-faceted, especially for vulnerable and underserved populations. The strategies for sustainable oral health care provision and access are wide. The WFPHA OHWG has developed resolutions to tackle two very common diseases in adulthood, cancer and dementia, as well as a resolution, calling for improvement in access to oral health for children, inspired by the Charter enabler functions [32,33,34]. The first two resolutions provide a strong structure to shape policies that improve oral health access and all adopt the life course approach that is “the study of long-term effects on chronic disease risk of physical and social exposures during gestation, childhood, adolescence, young adulthood and later adult life”. Therefore, oral health care services should be accessible from gestation (i.e. antenatal oral health advice), through childhood and adulthood. This approach does not only include curative health services but also preventive and educational services, in the hope that they will adopt healthy behaviors throughout their life course. A government’s role in health care is to purchase and provide health care; ensure access; regulate health care markets; license health and regulate health care providers; support, develop and evaluate research; monitor oral health care quality; inform policymakers; develop the workforce; educate the public, and engage stakeholders. Public policies such as regulation of unhealthy products at global and national level as well as effective community based interventions should be the foundation for better oral health in all countries. It is the government’s responsibility to ensure the provision of prevention and treatment services since market forces alone result in gross inequities in every country. Legislation and regulations are needed in every country to develop and implement appropriate public health strategies10. These strategies should facilitate the development of strong, resilient and secure health systems integrating oral health as a part of public health in general, and should be based on a common risk factor approach addressing risk factors for many chronic conditions within the context of the wider socio-environmental milieu, including but not limited to sugar, tobacco, mercury, fluoridation, etc. Although this intervention is needed in all countries, special attention should be paid to low income communities, even in developed countries, where the quality and safety of health care nor the variety of oral health prevention policies (e.g., sugar sweet beverage tax) are often not in place. In low income communities most, if not all, of the population may not be able to access or afford dental care, which is provided to internationally acceptable standards of infection control. In a survey conducted in Tanzania, the expense of extractions and fillings was compared with daily resources that an adult requires for basic consumption (DRC). Tooth extractions were found to cost patients an average of four-times their DRC and fillings on average 9-10 times the DRC. It is therefore a sensible decision that the cost of infection control and prevention in dental care settings should be subsidized by national governments to assure safe dentistry. 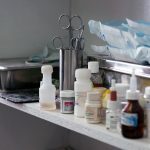 The WFPHA has adopted a resolution to exempt tax on dental supplies and equipment for infection control and prevention. In May 2015, the framework for Access to Oral Health for Children was formally adopted by the Mexico City government as part of the “Cada niño tiene derecho a una buena salud bucal (Every child has the right to good oral health)” program that incorporates healthy eating, hand hygiene and tooth brushing in schools. This resolution has since been adopted in Chile under a different name. A resolution on oral health for individuals with dementia and the elderly in general, jointly presented with the International Council of Nurses, has been added as a document in the 67th World Health Assembly under the point 14.4 Multi-sectorial Action for a Life Course Approach to a Healthy Ageing on 19-24 May 2014 in Geneva. On 23-28 May 2016, the OHWG presented a resolution on the integration of oral health into primary health care and public health systems in the World Health Assembly in Geneva under the agenda point 16.1 Health Workforce and Services. At the recent World Health Assembly on 22-31 May 2017, the OHWG proposed a resolution calling for tax exemption on dental supplies and equipment for infection control and prevention under agenda point 17 K – Strengthening emergency and essential surgical care and anesthesia as a component of universal health coverage. The success of The Ottawa Charter for Health Promotion is a case study on the importance of global public health consensus as it has often been described as a catalyst for the establishment of health promotion as an important discipline in public health, orienting governments, institutions and public health professionals. Even though it has been 31 years since the declaration of the Ottawa Charter, it has continued to be a backbone for other crucial health promotion agendas such as Jakarta Declaration on Leading Health Promotion into the 21st Century, The Bangkok Charter for Health Promotion in a Globalized World and the Shanghai Declaration on Promoting Health in the 2030 Agenda for Sustainable Development. At the Melbourne World Congress on Public Health in 2017, the WFPHA also made a demand for action on government and public health professionals. All these public health movements were made possible due to global consensus on health promotion. A similar momentum needs to be generated to push the integration of oral health into all public health systems. Unifying bodies such as the WHO, FDI and national public health associations should create a platform for heads of state, public health professionals (not limited to dental professionals), research and academic institutions, civil society organizations, and other stakeholders to come together to develop and action plan that can be applied globally. The Charter provides a solid yet flexible framework that allows for policy development and implementation. Implementation of dental public health curricula with a transdisciplinary approach and acting as custodian of accountable information related to the field. Reviewing and updating relevant legislation and ensuring its proper enforcement. Supporting the implementation of coordinated preventive actions, including an effective communication strategy, taking in consideration the social determinants impacting oral health. Developing and implementing quality accessible services with a special focus on most vulnerable populations. Developing appropriate and accountable partnerships with relevant actors including but not limited to ministers, health professionals, corporates, multi/bilateral organizations, communities, etc. Developing innovative methods based on the common risk approach. Developing innovative and sustainable financing mechanisms appropriate to the context. National public health systems may have made tremendous efforts in coordinating oral health services, but there is an urgent need for international coordination to promote equity across different nations and reduce inequalities. Global multi-sectoral dialogues, coordination and decision-making can help identify the different population needs and formulate interventions that best suit recent developments in oral health services. Public health has benefited from global coordination efforts in emergency preparedness, although oral diseases are not generally viewed as urgent in nature, the integration of oral health into global public health systems can also benefit from international dialogues. Resilient and secure public health systems at national level can be established worldwide through coordinated global efforts. With the ever growing demands for accountability and innumerability of evidence-based  programs and policies, it is vital to ensure that all health inventions have comprehensive monitoring and evaluation processes. in all public health sectors is needed to advocate for strong oral health prevention and treatment strategies. The WFPHA calls for governments and multilateral organizations to develop international health regulations to facilitate coordination among partners in implementation of an oral health agenda that is based on the services and functions of the Global Charter. Figure 2 illustrates a summary of the services and functions in the global call to action. These include inter-governmental parties at international, national, regional and local levels, civil societies, educational institutions and corporations. These partners need to reorient their systems and strengthen ties for better health outcomes. This paper aims to provide guidelines on how oral and public health agendas can be aligned to face the barriers that prevent effective and coordinated approaches. Communication and advocacy with policymakers through innovative approaches are keys to achieve this goal. Of note, although some services share some common subcategories, each subcategory has been added under the most pertinent service. Leaders in public health and oral health need to develop concrete and coordinated actions to tackle common risk factors. It has been demonstrated through evidence-based research that oral diseases share common risk factors with major chronic diseases. It is time for public health professionals to see oral diseases as NCDs that deserve global attention and not segregate health promotion interventions. These actions should be conducted with an eye to sustainability and primary prevention with respect to threats to the public’s health as a whole. This should be the beginning of a long process that will not be limited to the integration of oral and public health but will lead to the setup of strong, resilient and secure health systems embracing oral health as a part of the whole, based on true government engagement and coordination with all appropriate actors within and outside the dental filed. Health protection through adequate legislation, diseases prevention and health promotion needs to be recognized as mandatory for the future development of humanity. WHO. What is the burden of oral disease? [16 March 2018]; Available from: http://www.who.int/oral_health/disease_burden/global/en/. Lomazzi M. A Global Charter for the Public’s Health-the public health system: role, functions, competencies and education requirements. Eur J Public Health. 2016 Apr;26(2):210-2. Sheiman A. Oral health, general health and quality of life. 2005 [28 March 2018]; Available from: http://www.who.int/bulletin/volumes/83/9/editorial30905html/en/. Sischo L, Broder HL. Oral health-related quality of life: what, why, how, and future implications. J Dent Res. 2011 Nov;90(11):1264-70. Petersen P. Tobacco and Oral Health – the Role of the World Health Organization. Oral health prev. 2003;1:309-15. Peterson P, Bourgeois D, Ogawa H, Estupinan-day S, Ndiaye C. Policy and Practice: The global burden of oral diseases and risks to oral health: Bulletin of the World Health Organization2005. Dieleman JL, Baral R, Birger M, Bui AL, Bulchis A, Chapin A, et al. US Spending on Personal Health Care and Public Health, 1996-2013. JAMA. 2016 Dec 27;316(24):2627-46. Listl S, Galloway J, Mossey PA, Marcenes W. Global Economic Impact of Dental Diseases. J Dent Res. 2015 Oct;94(10):1355-61. Watt RG, Fuller SS. Oral health promotion–opportunity knocks! Br Dent J. 1999 Jan 9;186(1):3-6. Tang N, Eisenberg JM, Meyer GS. The roles of government in improving health care quality and safety. Jt Comm J Qual Saf. 2004 Jan;30(1):47-55. CDC. Disparities in Oral Health. [19 March 2018]; Available from: https://www.cdc.gov/oralhealth/oral_health_disparities/index.htm. Garcia I, Tabak LA. Global oral health inequalities: the view from a research funder. Adv Dent Res. 2011 May;23(2):207-10. Hayden C, Bowler JO, Chambers S, Freeman R, Humphris G, Richards D, et al. Obesity and dental caries in children: a systematic review and meta-analysis. Community Dent Oral Epidemiol. 2013 Aug;41(4):289-308. Albert DA, Ward A, Allweiss P, Graves DT, Knowler WC, Kunzel C, et al. Diabetes and oral disease: implications for health professionals. Ann N Y Acad Sci. 2012 May;1255:1-15. Lee PN, Forey BA, Coombs KJ. Systematic review with meta-analysis of the epidemiological evidence in the 1900s relating smoking to lung cancer. BMC Cancer. 2012 Sep 3;12:385. Llewellyn CD, Johnson NW, Warnakulasuriya KA. Risk factors for squamous cell carcinoma of the oral cavity in young people–a comprehensive literature review. Oral oncology. 2001 Jul;37(5):401-18. Sherwin GB, Nguyen D, Friedman Y, Wolff MS. The relationship between smoking and periodontal disease. Review of literature and case report. N Y State Dent J. 2013 Nov;79(6):52-7. Jeffcoat MK, Jeffcoat RL, Gladowski PA, Bramson JB, Blum JJ. Impact of periodontal therapy on general health: evidence from insurance data for five systemic conditions. Am J Prev Med. 2014 Aug;47(2):166-74. Donoff B, McDonough JE, Riedy CA. Integrating oral and general health care. N Engl J Med. 2014 Dec 11;371(24):2247-9. Sheiham A, Watt RG. The common risk factor approach: a rational basis for promoting oral health. Community Dent Oral Epidemiol. 2000 Dec;28(6):399-406.
WHO. NCD and the Sustainable Development Goals. 2017 [28 March 2018]; Available from: http://www.who.int/global-coordination-mechanism/ncd-themes/sustainable-development-goals/en/. NCD Alliance, FDI World Dental Federation. Accelerating actions on oral health and NCDs: Achieving an integrated response. 2017; Available from: http://www.fdiworlddental.org/sites/default/files/media/resources/ncda_fdipolicy_brief_oral_health_ncds.pdf. Pitts N, Mazevet M, Mayne C, Hinrichs S, Boulding H, Grant J. Towards a cavity-free future: How do we accelerate a policy shift towards increased resource allocation for caries prevention and control? 2017; Available from: https://www.kcl.ac.uk/sspp/policy-institute/publications/Towards-a-cavity-freefuture.pdf. FDI. No Health without Oral Health. 2017 [28 March 2018]; Available from https://www.fdiworlddental.org/sites/default/files/media/resources/fdiwdc2017_ncd_session_proceedings.pdf. WHO. Future Use of Materials for Dental Restoration. 2011 [28 March 2018]; Available from: http://www.who.int/oral_health/publications/dental_material_2011.pdf. Moore M, McKee M, Borisch B, Ricciardi W. The Global Charter for the Public’s Health. Eur J Public Health. 2016 Apr;26(2):207. Lomazzi M, Wordley V, Bedi R. Dental public health capacity worldwide: Results of a global survey. J Public Health Policy. 2016 Dec;37(4):528-42. DENTISTRYIQ. What mid-level dental providers do and why you should know about it. 2014 [15 March 2018]; Available from: http://www.dentistryiq.com/articles/2014/08/rdhgrad-what-mid-leveldental-providers-do-and-why-you-should-know-about-it.html. WFPHA. The integration of oral health into primary health care and public health system 2016 [16 March 2018]; Available from: http://www.wfpha.org/resolutions-details/90-oral-health-issues. WFPHA. Oral Health for Children. 2013 [16 March 2018]; Available from: http://www.wfpha.org/images/declarations/OralHealthForChildren.pdf. WFPHA. Oral Health for Individuals with Dementia 2014 [16 March 2018]; Available from: http://www.wfpha.org/images/WGs/Oral_Health/Oral_Health_for_Individuals_with_Dementia_Approved.pdf. Nyamuryekung’e KK, Lahti SM, Tuominen RJ. The relative patient costs and availability of dental services, materials and equipment in public oral care facilities in Tanzania. BMC Oral Health. 2015 Jul 01;15:74. WFPHA. Exempt Tax on Dental Supplies and Equipment for Infection Control and Prevention. 2017 [16 March 2018]; Available from: http://www.wfpha.org/images/Annelysse/Tax_infection_final.pdf. WFPHA-OHWG. 2013 – Child Human Rights – Resolution on Access to Oral Health for Children. Since 2013 [15 March 2018]; Available from: http://www.wfpha.org/oral-health-wg#resolutionsimplementation. WHO. The Ottawa Charter for Health Promotion. 1986 [28 March 2018]; Available from: http://www.who.int/healthpromotion/conferences/previous/ottawa/en/. WFPHA. Melbourne Demand For Action. 2017 [25 April 2017]; Available from: http://www.wcph2017.com/d/WCPH2017-Melbourne-Demand-for-Action.pdf. Cummings GG, MacGregor T, Davey M, Lee H, Wong CA, Lo E, et al. Leadership styles and outcome patterns for the nursing workforce and work environment: a systematic review. Int J Nurs Stud. 2010 Mar;47(3):363-85. You may download the PDF version here. Yes! Please add me to the annual OHWG newsletter.